There are four pairs of overlapping warp chains, with stripes to line up. I created a mess. A few options to consider: 1. Give up. 2. Weave it as is, destroying the design. 3. Use two sets of lease sticks, and expect problems with threading (2,064 ends). 4. 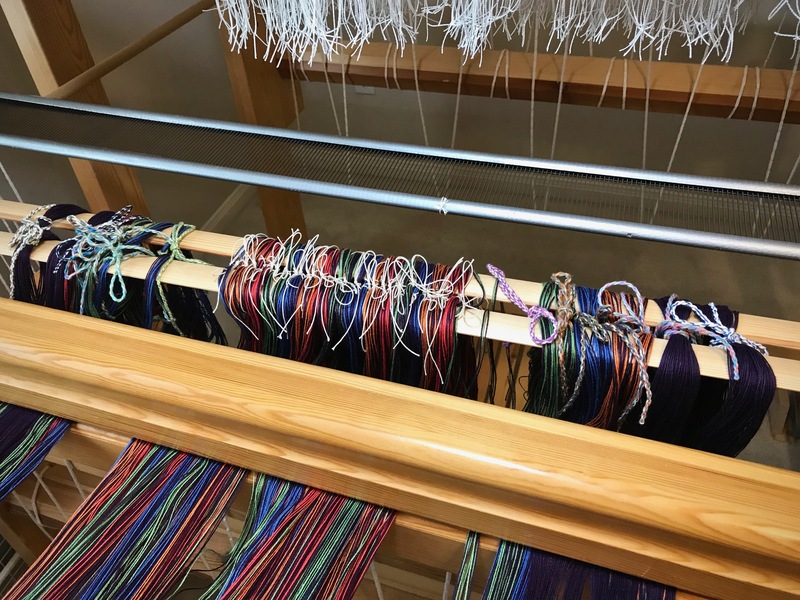 Transfer all ends to a single set of lease sticks, arranging threads in order for each stripe. Each of four warp chains were duplicated when I realized I had wound only half the correct number of ends in each chain. Option 4 seems the riskiest. If I lose the cross while transferring threads, I have an even bigger mess. It’s all or nothing. Go for it! Fortunately, my apprentice, Juliana, arrives in the nick of time to give me a hand. Lease cross is tied separately for each color “partial” stripe. 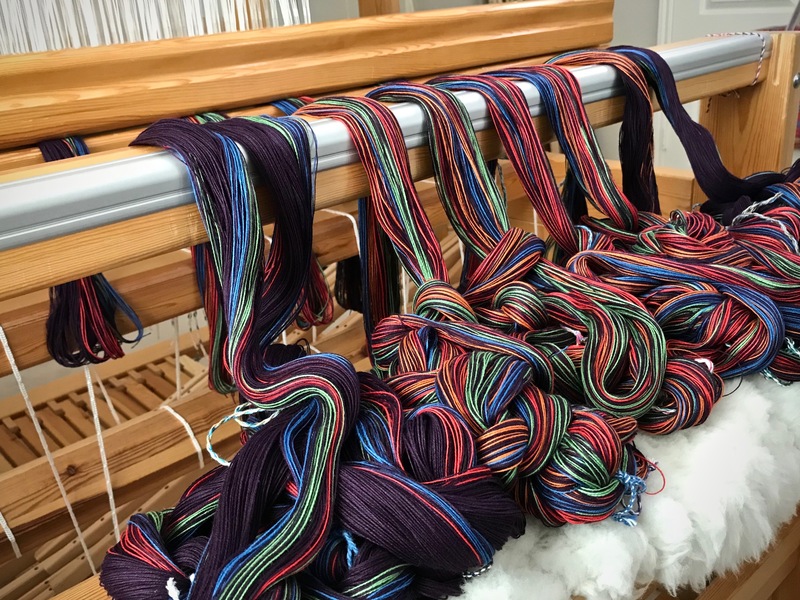 Stripes from the two warp chains are transferred to a single set of lease sticks. Now the stripe colors are at their full correct width. 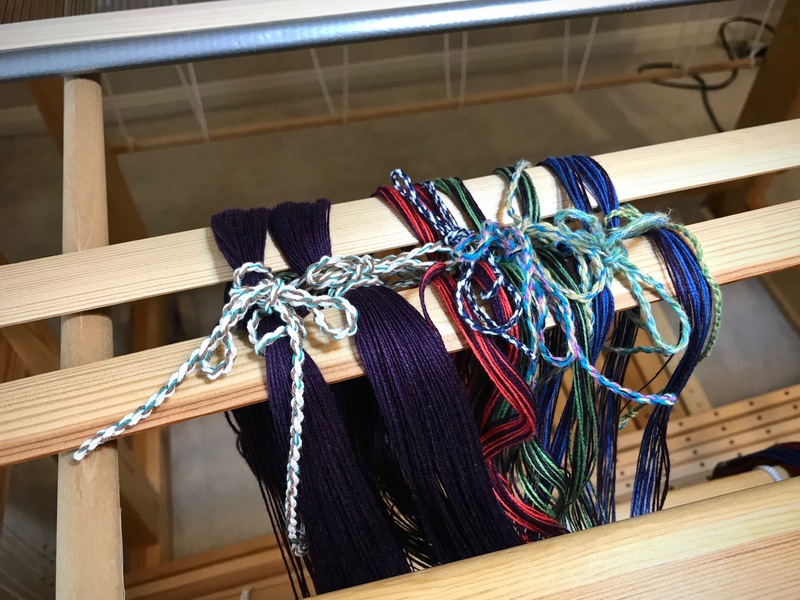 For the four center warp chains, each section of color is separated and tied at the cross. It takes an extra set of hands to transfer them in order to the primary set of lease sticks. All warp ends are now successfully transferred to a single set of lease sticks. 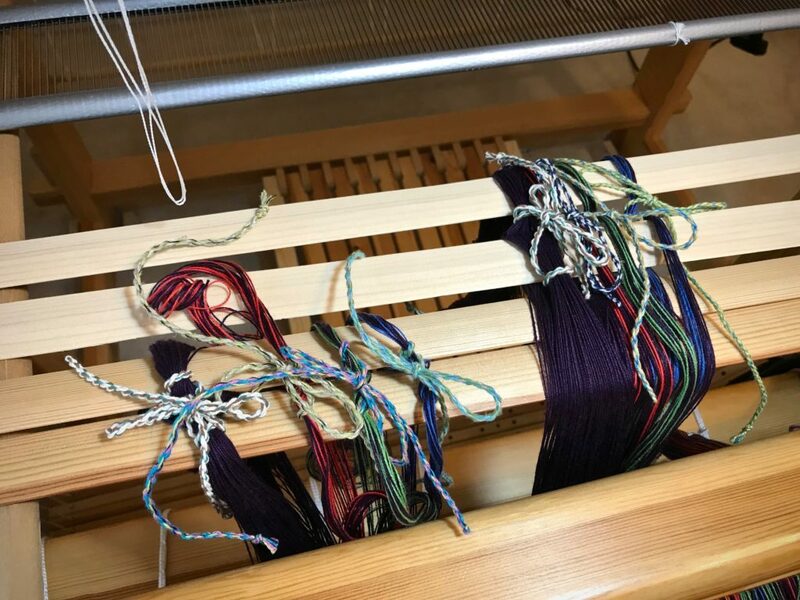 Let the loom dressing begin! It worked! All the threads are successfully transferred to one pair of lease sticks. What a relief! I can beam the warp knowing that all is well. 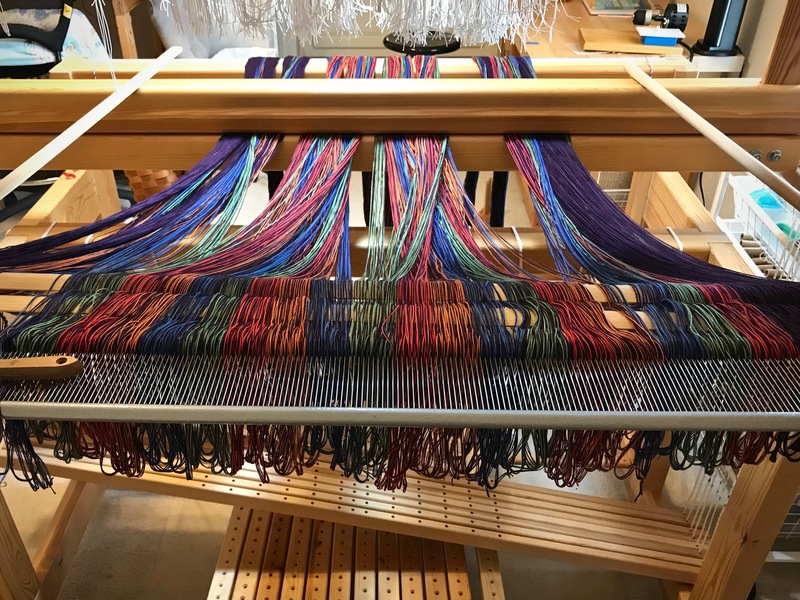 A beautiful double weave throw is imminent. 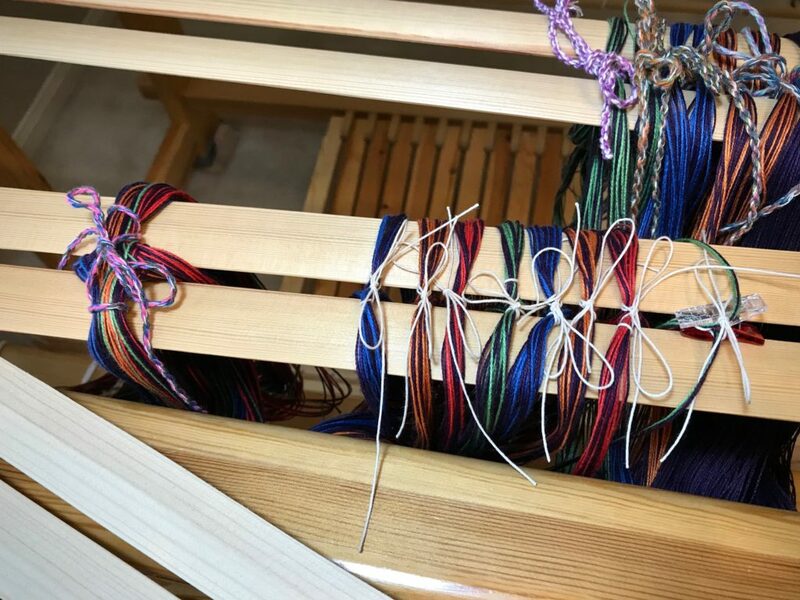 Warp is pre-sleyed at the loom. So far, so good. Ready to beam! Looking forward to this dressing and weaving experience. We all have made a mess of our lives, and we know it. We hear of options to fix things, but one seems the riskiest: Transfer everything to God. But what if I mess that up, too? There’s good news. God transfers us. When we place our trust in Jesus Christ, God transfers us from our messy state to his good order. 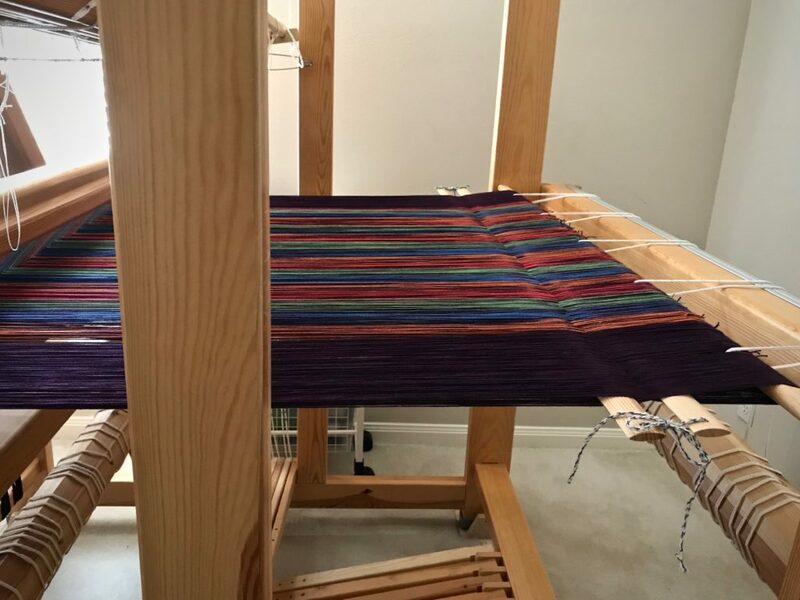 And the result is a weaving that showcases his workmanship—a beautiful you. May you take a worthy risk. Hi Joyce, It is a relief when we see things begin to work out! And what a relief it is to trust our great Lord with the most important things in life. And so glad the mess worked out. But I knew quitting was never an option for you, Karen! I know that was frustrating, Karen. Been there, done that, although with a smaller warp. Perseverance pays offf! D’Anne, That is so true! Perseverance does pay off! I think that is something that has been a part of me since childhood – quiet perseverance. Thanks for making me stop and reflect on that for a moment. God does fix our messes in unexpected ways. …. when we ask. And I thought 398 ends of only two colors were a challenge! Perspective and perseverance are helpful tools. Thank you for sharing your faith! Hi Linda, It is crucial for us to have the humility to ask God for help out of our messes. Perspective and perseverance are indispensable!